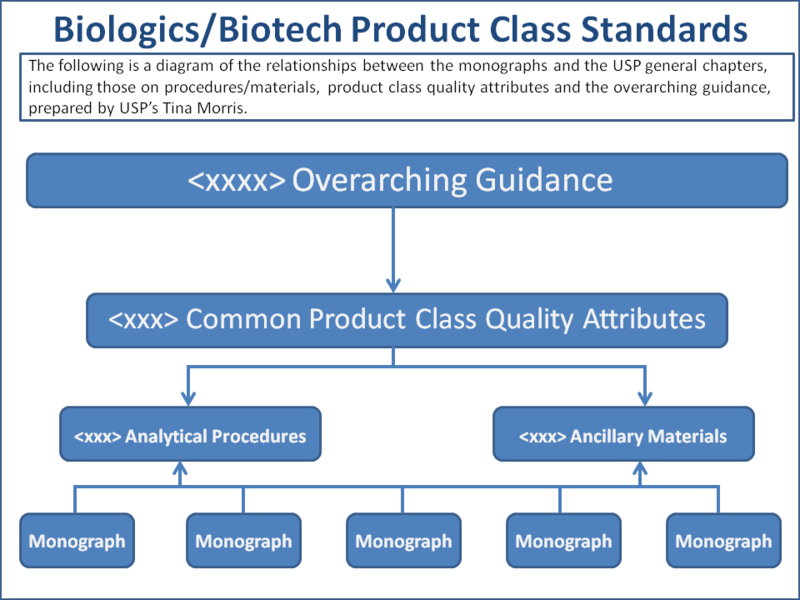 USP has set an aggressive goal of April, 2012 to complete drafts of a mandatory general chapter (<129>) covering critical quality attributes (CQAs) of recombinant therapeutic monoclonal antibodies (MAbs) and an informational general chapter (<1260>) addressing a broader range of monoclonal manufacturing and control issues. The expert panel overseeing the drafting of the two new MAb chapters was formed in January under the direction of Amgen Global Product Quality and External Affairs Executive Director Anthony Mire-Sluis, who has created a number of subcommittees that are working on various portions of the two documents. 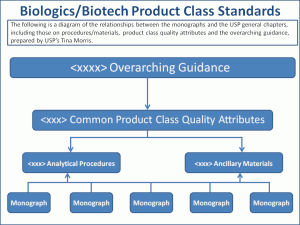 MAb chapter <129> is one of a series that USP will be developing on quality attributes for different types of biologic/biotech products, including enzymes, vaccines and peptides. The development of the quality attribute chapters including <129> is called for in the work plan for the current USP five-year cycle (2010-2015). The effort on <1260> continues an initiative begun under the previous cycle. The subcommittee on general chapter <1260> – an overarching chapter that provides general guidance about various aspects of MAb structure and function – is being chaired by OncoMed Process Development VP Michael Mulkerrin, who also chairs the Biologics and Biotechnology Expert Committee. The chapter will provide manufacturers with guidance on: ● how to develop a monoclonal antibody ● what critical information is needed to define quality attributes ● how to create expression vectors and manufacturing processes that are associated with the downstream purification, formulation and filling of those products, and ● attributes of the facilities that MAbs are made in. 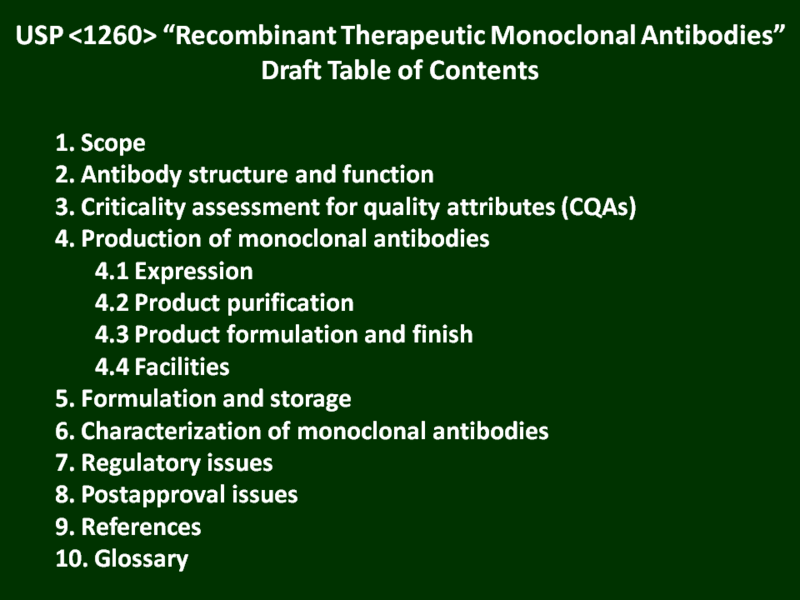 Other sections will deal with monoclonal regulatory and post-approval issues. Genentech Technical Regulatory Policy and Strategy Director Earl Dye provided an update on the USP MAb effort at the RAPS annual meeting in Indianapolis, Indiana in late October, referencing a report by Mire-Sluis at the USP Science and Standards Symposium in Seattle, Washington a few weeks earlier. Chapter <129> will hone in on quality attributes common to monoclonal antibodies and details of the tests used to measure the attributes. 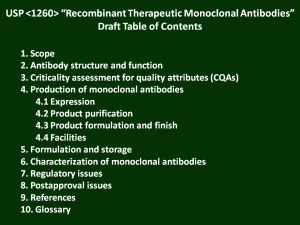 Included will be the minimum quality standards required for all monoclonal antibodies, how to identify appropriate quality attributes, and details such as analytical procedure and system suitability requirements for doing those kinds of assessments. According to Mire-Sluis, <129> is designed to be “flexible” in its approach in terms of determining quality attributes to assure the minimum level of quality. The authoring team feels that a flexible approach is needed due to the unique quality attributes of each MAb, such as: ● the ligand it binds to ● the potential for effector function ● differing glycosylation patterns, and ● the nature and extent of N- and C-terminal heterogeneity.